Say it with a smile...nah....scrap that...say with a t-shirt instead. Check out the twitter influenced white t-shirt to the public by British high street clothing giant Topshop recently brought to Sydney shores in October this year. 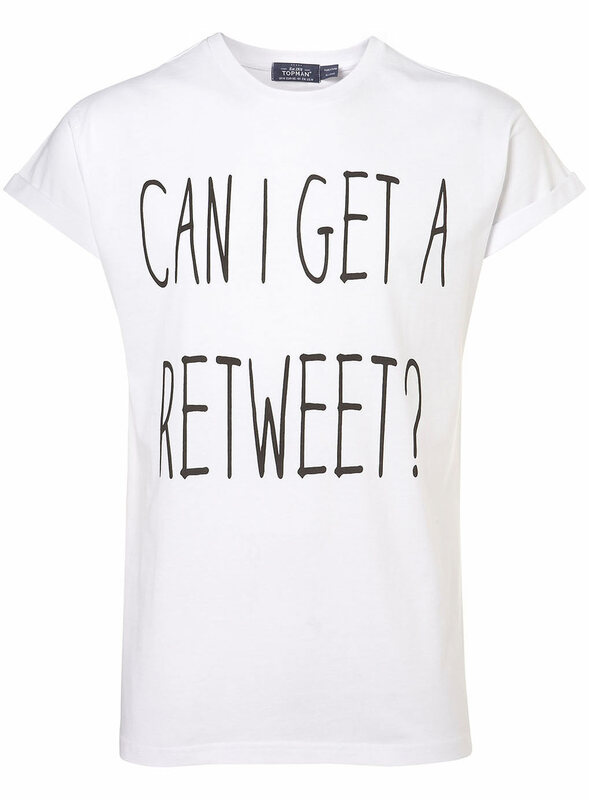 With the words “Can I get a Re Tweet” firmly placed across your chest plate for all to see this garment maybe the start of things to come in your ever growing social media circle. For me, all that’s missing from this picture is an “insert here” slogan with you username cemented firmly on the back for all to see whilst you walk past fellow tweeters. The term “keeping it simple” while “getting the message” across highly springs to mind when describing this tee which would definitely compliment the dark pair of stone washed jeans and pair of ice white pumps that would be highly recommended by yours truly to rock with it. So with the question in mind, will this item of clothing do you any favours?!? Probably not, but whilst were trapped in a rapidly changing society you gotta stay down with the kids right?!? So what better way to do it than letting the world know that you’re too cool for school...Next stop....”Snap me up on Instagram” perhaps......Pin-teresting?! ?